Automation, which has become a major focus for most of the industries, is directly impacting precision gearbox market growth. Despite the gearbox technology being a popular name across industries since long, its commercialization has taken a new shape in the recent years, thanks to the technological advancements which added value to these gearboxes in terms of accuracy and reliability. The gearbox is a perfect fit for servomotors to control the increasing load at high cycle rates in various industrial applications. There is essentially not much difference between industrial and precision gearboxes. Industrial gearboxes are more often used in applications for power transfer with high torque, where high level of accuracy is not obligatory. They are widely used in cement and aggregates, material handling, and mining industries. In contrast, precision gearboxes are used in applications where a high level of precision and stability is mandatory. These gearboxes find widespread applications in the robotics, food & beverage, machine tools, military & aerospace, and packaging sectors, providing an impetus to global precision gearbox market. The fact that both, industrial and precision gearboxes are used in different application arenas, has made no difference to their adoption rates, for they both find significant utilization in various industry verticals. Why is a gearbox used? One of the key reasons to use a gearbox is for the purpose of torque multiplication. Incorporation of the gearbox allows the designer to use a smaller servo system that consumes less energy, which in turn will provide the same power as that of a larger servo system, thereby saving space & money. This factor provides a mechanical advantage by means of reduced output speed and increased torque which will be suitable for several servo applications. Gearboxes can also solve the problem of inertia mismatches. A precision gearbox lowers the reflected inertia by the square of the reduction ratio. For example, a 16:1 gearbox minimizes the load’s reflected inertia by a factor of 256, which is indeed noteworthy. Inertia matching, speed reduction, and torque multiplication are the three basic reasons to use a gearbox. Apart from providing the benefits of the basic parameters, a precision gearbox provides high stability, better accuracy, high tolerance, compact size, high efficiency, and high torque density. According to experts, precision gearbox market will carve out a profitable growth map subject to the product’s superior features when compared to most other gear reducers. Furthermore, with these gearboxes offering an efficiency of more than 90%, precision gearbox industry is witnessing a remarkable upswing. 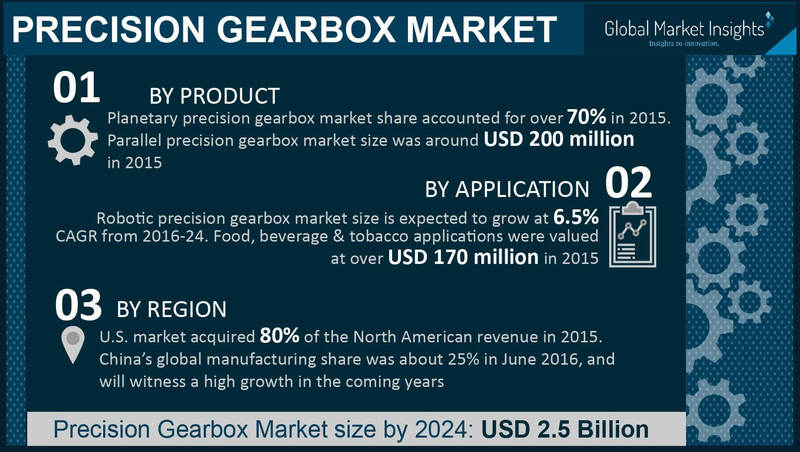 A forecast by Global Market Insights, Inc., stated that precision gearbox market is likely to grow at an annual rate of 5.2% over the period of 2016-2024. Rising demand for automation and increasing operational efficiency will soar precision gearbox industry growth in the F&B sector. On these grounds, market leaders are increasingly adopting precision engineered power transmission components for all types of food processing applications. Global precision gearbox industry from the food and beverage application generated revenue worth over USD 170 million in 2015. Moreover, mounting demand for automation and the need to enhance productivity in the F&B and tobacco industries of developed nations will necessitate the requirement for efficient sustainable packaging, production and transportation solutions. For this reason, many of the world’s OEMs are choosing the highly-engineered precision gearbox for their power transmission needs, thereby leading to global precision gearbox industry earning a stupendous revenue over time. Precision gearbox industry is witnessing high degree of product penetration in industrial and service robotics applications for enabling highly precise movements. In this regard, customized precision gearboxes designed to support application-specific movements are rapidly gaining popularity. Tailored products of precision gearbox market also fulfill the demands of complex positioning and a smooth, flawless functionality. Precision gearbox industry from the robotics sector is likely to record a Y-O-Y growth of 6.5% over the period of 2016-2024. Major companies are now focusing on utilizing the joint efforts of robots and humans. In effect, a line of niche-specific machines called collaborative robots have been developed for enhancing the overall productivity in manufacturing companies. ‘Co-bots’, as they are called, assist the workers to perform the heavy work such as lifting components or loading complex machines. The rising popularity of co-bots in precise manufacturing will prompt companies to invest in their design and development, thereby propelling global precision gearbox market, which is likely to hit a record-high revenue worth billions. For humans and robots to work in tandem on the same shop floor, market players plan to invest heavily in the production of co-bots for the purposes of high flexibility and automation. Precision gearbox industry is also forecast to profit heavily from the demand for automation, owing to which key players are gearing up to provide innovative planetary gearboxes with high accuracy in positioning. The high-speed pick-and-place device is another automated product that successfully deploys the precision gearbox. The moving arms of this device are usually lightweight to decrease the load, however, inertia mismatch can still be a problem. This can be resolved by using the gearbox, which renders the mechanism to be extremely flexible and highly responsive. Myriad industrial sectors have witnessed the production of a plethora of such automated products, which will undeniably impel global precision gearbox market share. Advanced machinery has always been a priority for major industries worldwide. The development of the precision gearbox over the years has assured a fine tune in the optimization of assembly lines and machine floor processes. As these products continue to meet a wide range of automation challenges, precision gearbox industry will gain considerable traction. Automation in production process has raised the performance bar and has also provided high potential by ensuring value creation in these industries.